The sun is shining today, but yesterday was definitely a soup day. I love soup, but can’t bring myself to eat it much during the summer heat. As soon as the weather starts to cool off, I start making soup. 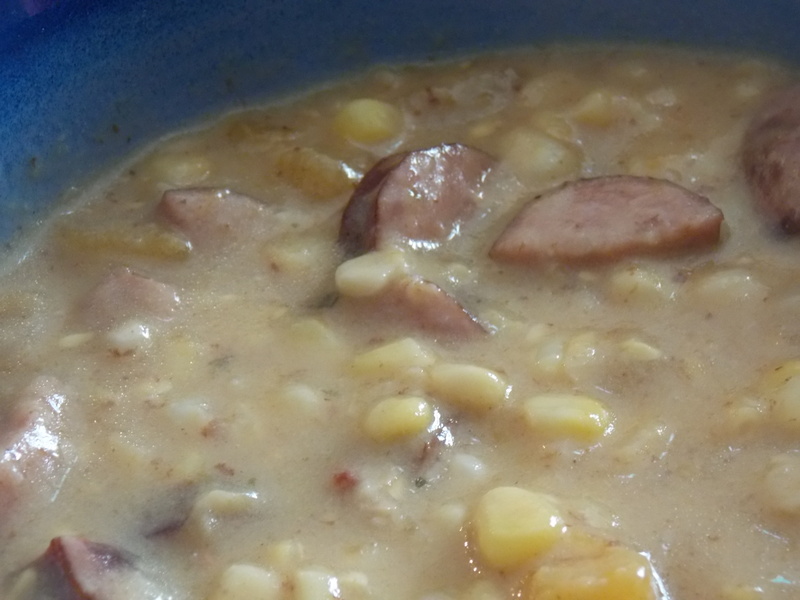 This is one of my favorites to make early since I can still get fresh corn. But, it’s great throughout the winter too because it tastes just as fabulous with frozen corn. This recipe is huge. Half it if you want. Freeze part of it for a quick meal another night. Or, do what I did, and take half of it to some friends – they’ll be grateful, you’ll feel great and it isn’t any more work. I paired this with Honey French Bread (one loaf for me and one for my friends). Just use this recipe and omit the cracked black pepper. Start off by cutting your smoked sausage and browning it in a large soup pot. When the sausage just starts to brown, add the butternut squash and cook until the squash just starts to soften around the edges. Add stock and corn and then scrape the corn cobs to get all these delicious, flavorful bits into your soup. Good quality, well seasoned stock makes a big difference in soups. Making your own is simple. Get my recipe here. You could skip the first two steps and just toss all the ingredients into the stock at the same time and simmer until the squash is tender, but you’ll miss the extra flavor that comes from browning the sausage and pan roasting the squash. Either way, when the squash is tender, mix flour and milk together and add to the soup. Cook until slightly thickened, taste for seasoning and serve. 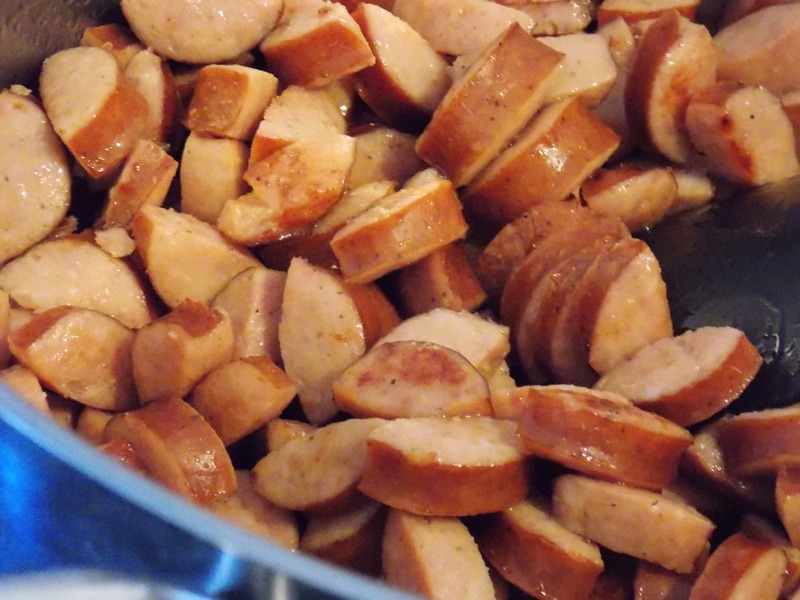 Cut smoked sausage into half rounds and place in large soup pot over high heat to brown. 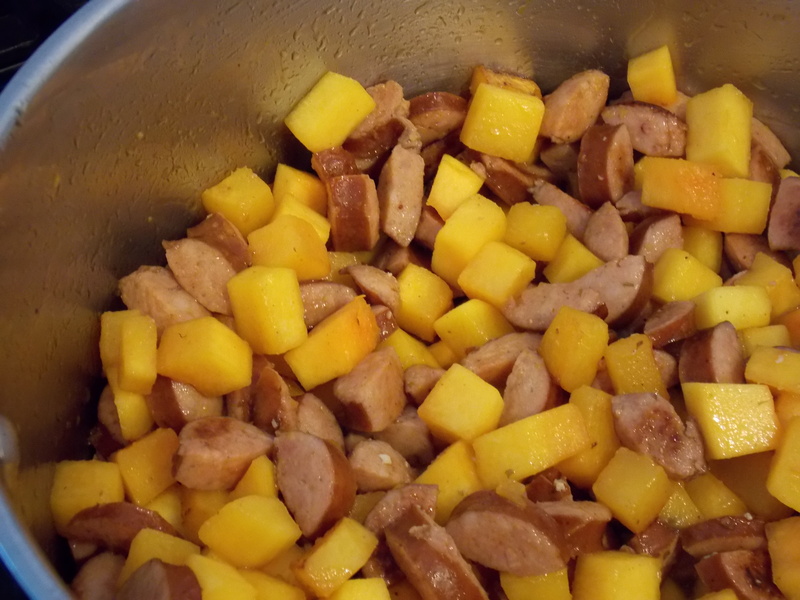 When sausage just starts to brown, add diced butternut squash. While that is cooking, cut corn from the cob. 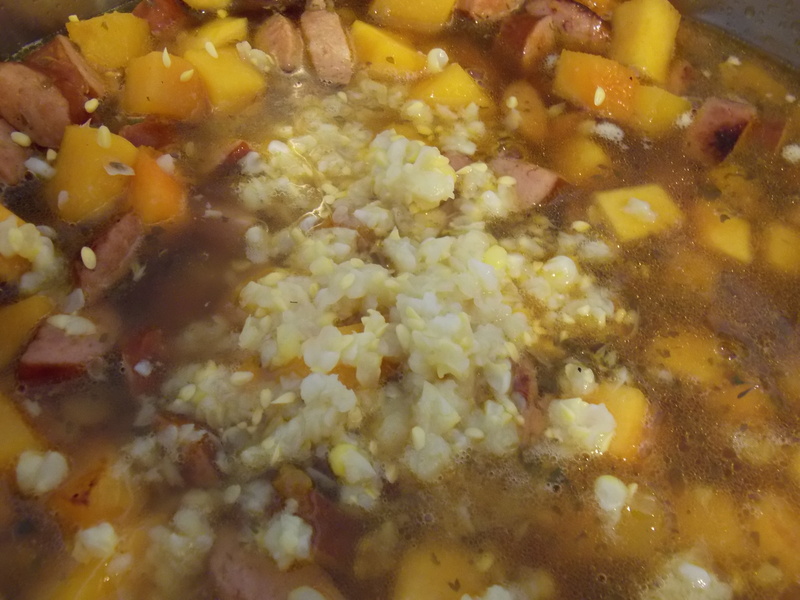 Add stock and corn to the pot with the sausage and squash. Hold each corn cob over the pot and scrape with a paring knife. Stir and simmer until squash is tender. Mix together milk and flour. Add to soup and cook just until slightly thickened. Season with salt and pepper to taste. Serve hot with crusty bread. What could be better than pork tacos? 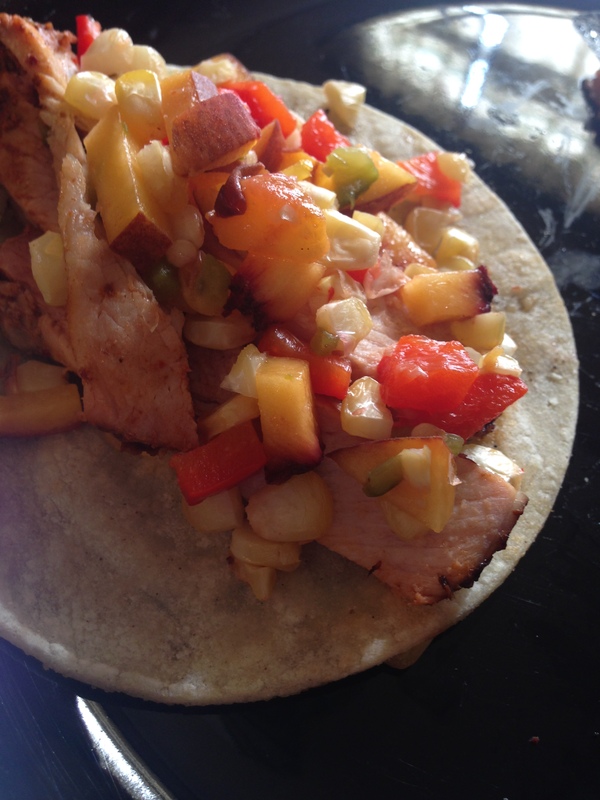 Pork tacos topped with grilled peaches, corn and roasted peppers. I swear this taco tastes like summer. And for the record, I totally ate the peach and corn relish for lunch today, by itself, with a spoon. Yup, it is that good. I only managed to snap one picture on Tuesday, but it’s enough to whet your appetite. The recipe takes a little more time than some of my others, but there is nothing particularly difficult and it is oh so worth the effort. Remove stems and seeds from dried chiles. Break chiles in half and soak in hot water until rehydrated (I think I left mine for an hour or so, but you could probably do less). Pour liquid, chiles, garlic cloves, cumin and salt in blender and blend until smooth. Pour chile paste over pork loin in a shallow dish or ziplock bag and marinate for 2-3 hours. Preheat your grill. Remove pork loin from marinade, but don’t scrape off the paste that sticks. Place loin on grill and sear over direct heat for 5 minutes on each side. Move loin off of direct heat and continue cooking until desired doneness (I cooked mine for about an hour and a half). Toward the end of the cooking time, Place corn, bell pepper and jalapeno over direct heat. Cut peach(es) in half and remove pit. Add the peach, flesh side down, when you flip the vegetables. Remove everything from the grill when the peppers are charred and the corn and peach are roasted. Set pork loin to rest while you prepare the relish. Peel, seed and dice the peppers (I like to mince my jalapeno). Cut corn off the cob. Dice peach. Place diced vegetables and peach in a bowl and add garlic powder, onion powder and salt to taste. Brush both sides of corn tortillas with oil and heat over the grill until soften and slightly charred, flipping once. Slice pork loin into strips. Pile tortilla with pork strips and relish and dig in. Growing up, we always ate leftovers. Mom would plan a leftover night into her weekly menu plans. I loved leftover night. Everyone got to eat what they wanted for dinner. I looked forward to enjoying things like lasagna and enchiladas that somehow seemed to be better as leftovers than they were that first night. My husband, however, is not a fan of leftovers. Since I can’t stand to throw out perfectly good food, this leaves me with a small challenge. How can I feed my husband leftovers without him knowing he’s eating leftovers. And thus, “More Than Microwaving” was born. In these posts, I’ll share with you creative and tasty ways to reinvent leftovers from recently shared recipes. 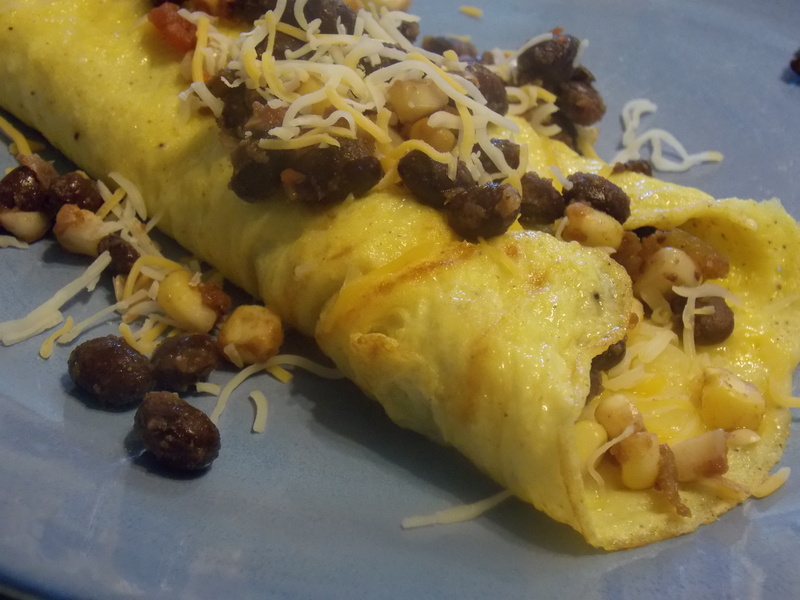 Today, I’ll share how to use leftover Black Bean and Corn Salsa to create a Southwest Omelet that makes a fabulous meal at breakfast, lunch or dinner. Place a non-stick skillet over medium low heat and add butter to skillet. While butter is heating, use a fork to beat together eggs and milk. Add salt and pepper to your preference. When butter is frothy, but not brown, add egg mixture to skillet. Let eggs cook until set around the edges. Gently pull edges toward the center of the pan and tip the skillet so that the uncooked egg runs to the edges and covers the exposed skillet bottom. Continue cooking until egg is almost completely set. Loosen the edges of the cooked egg all the way around the pan. Sprinkle the shredded cheese in a line down the center of the cooked egg. Pour the salsa on top of the shredded cheese. Fold one side of the omelet over the fillings. Loosen the entire omelet from the pan. Slide the folded edge toward your plate carefully and flip the unfolded edge on top. Garnish with more salsa and extra cheese if desired. My daughter has a new obsession with Taco Tuesday. I assume this comes from a combination of watching the Lego movie more times than I can count and the influence of her step-siblings at dad’s. Ground beef tacos get boring to me after about one meal, so, this summer, I’ve put together some taco recipes that combine different ingredients and flavors while staying true to the spirit of a taco. 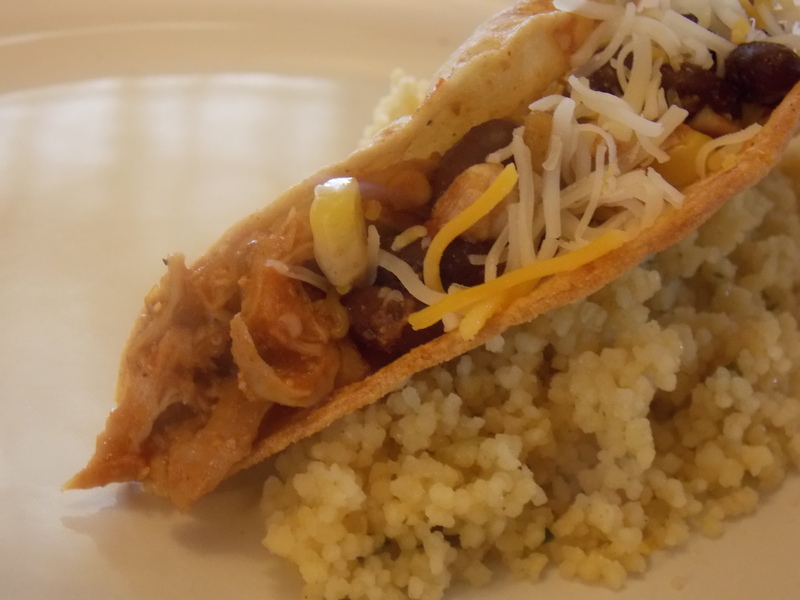 This chicken taco recipe is simple and delicious – both high priorities when considering a meal in our house. 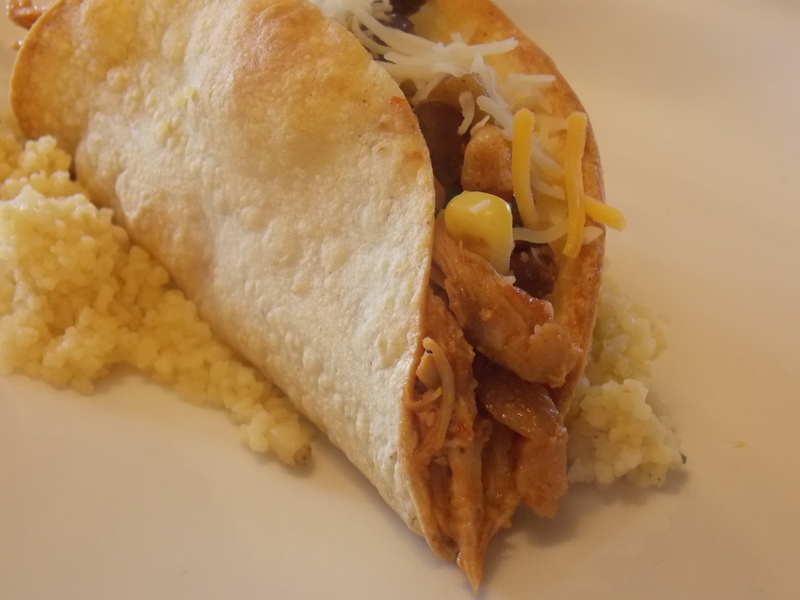 This recipe combines tender chicken, your favorite salsa, sweet summer corn and flavorful black beans into a taco that even my picky middle child will sit down and eat. Place chicken, salsa and taco seasoning in a crockpot set on low. Cook for 5-6 hours. Use forks to shred meat. Keep warm until ready to use. (The longer you hold the chicken in the crock pot, the more the sauce will dry out. If you are planning to keep it for a while, check periodically and add water if needed). For the salsa, place a grill pan over high heat (a cast iron pan or griddle will also work, or you could just do this on your grill). Place the corn on the hot grill pan and cook, turning occasionally, until some kernels develop a toasted brown color. Remove corn from pan and allow to cool (If you are using canned or frozen corn, you can toast them a little in a hot skillet or you can skip this step all together) While the corn is cooling, combine beans, salsa and cumin in a sauce pan. Slice corn kernels off the cob and add to the saucepan with the beans. Stir and heat until warm. This is my personal favorite step – assemble and garnish. My husband and the boys prefer flour tortillas and my daughter and I prefer crisp corn tortilla shells. Cheese, lettuce (or shredded cabbage), tomatoes, onions, guacamole and sour cream would all be fabulous. I like to set the garnishes up in a line and let everyone (or at least the three of us old enough to fix our own plates) make their own taco creations. This one is mine.